Vancouver, BC - Skyharbour Resources Ltd. (TSX-V: SYH) (OTCBB: SYHBF) (Frankfurt: SC1N) (“Skyharbour”) is pleased to announced that it has completed and filed an NI 43-101 Technical Report on the Moore Lake property currently being optioned from Denison Mines Corp. (TSX: DML) (NYSE MKT: DNN) (“Denison”). The Technical Report is the culmination of previously reported and compiled historical data and geological reports and was commissioned in preparation for an upcoming drill program Skyharbour plans to carry out on the project. It provides a detailed description of the project including the historical exploration and drill results previously reported, as well as recommendations for future exploration programs. The Technical Report may be found on the Company website or under the Company's profile at www.sedar.com. Skyharbour recently announced an option to acquire 100% of the Moore Lake uranium project from Denison. The 35,705 hectare Moore Lake Project is an advanced uranium exploration property strategically located in the eastern portion of the Athabasca Basin region, which is known for its large scale and high grade uranium deposits and producing uranium mines. Previous exploration efforts on the property discovered high-grade uranium mineralization highlighted by drill hole ML-61, which intersected 4.03% eU3O8 over 10 metres at the Maverick Zone. The depth to the unconformity on the property is relatively shallow and significant additional discovery potential remains over several conductive trends both at the unconformity and in the underlying basement rocks. The Company is currently planning an initial drill program at the flagship Moore Lake project with details and news forthcoming. The Moore Lake Property is located approximately 15 km west of the eastern margin of the Athabasca Basin and lies along the eastern edge of the Wollaston-Mudjatic Transition Zone (WMTZ) and the eastern Wollaston Domain. The property is unconformably overlain by 200 to 325 metres of Athabasca sandstone. The sub-Athabasca crystalline basement rocks on the property consists of Archean granitic gneisses overlain by graphitic and aluminous pelitic gneisses, psammopelitic gneisses, psammites and Hudsonian granites. The dominant structural fabric is northeast trending, cut by several interpreted east-west and 070° trending structures. Skyharbour has yet to carry out any exploration on the property but the previous Kennecott-JNR-Denison joint ventures identified zones of mineralization including the main Maverick Zone as well as the “527” Zone and the Maverick NEX “525” Zones. Several other significant zones of potential mineralization also exist on the property. The Maverick Zone is found proximal to the Athabasca unconformity, typically just below and extending below the unconformity, at approximately 275 metres depth. The mineralization is thought to be controlled by a sub-vertical to a steeply dipping dextral strike-slip fault zone that controls the main Maverick Structural Corridor and intersecting moderately dipping graphitic stratigraphy. Intense fracturing and de-silicification, bleaching and clay alteration affect the sandstone over the fault zone. The basement rocks in turn are intensely bleached or clay replaced up to several metres below the unconformity along with sheared, brecciated and gouged intervals in the graphitic units. Some of the better previously reported historical drill results include: ML-48 which returned 4.015% U3O8 over 4.7 m; ML-55 which returned 5.14% U3O8 over 6.2 m, ML-61 which returned 4.03% eU3O8 over 10.0 m including 19.96% eU3O8 over 1.4 m; and ML-83 which returned 11.1 m of 1.81% U3O8, including 3.0 m of 5.64% U3O8, 7.1% nickel and 2.55% cobalt. Approximately 350 metres northeast of the Maverick Zone a similar zone of mineralization named the “527” Zone was identified. The best result obtained was from drill hole ML-101 which returned 1.53% U3O8 over 6.6 metres, including 2.22% U3O8 over 4.0 metres. These intervals of mineralization were accompanied by highly anomalous cobalt, copper, nickel and other pathfinder elements including boron in the sandstone and basement rocks. Despite the positive drilling results to date no reserve or resource calculations have been completed for any of the mineralized zones. Significant potential exists along the Maverick NEX target zone which occupies the northeastern 1.3 km of the Northeast Maverick Structural Corridor. Three northeast trending sub parallel graphitic conductors over a width of 450 metres were intersected accompanied by local structural disruption, clay alteration and anomalous copper, lead, nickel, zinc, boron, vanadium and uranium. The overlying sandstone column is likewise locally geochemically anomalous and affected by structural disruption, bleaching and desilicification but not to the extent that it is over the Maverick Zone. The best result from the Maverick NEX target was 4.5 metres of sandstone mineralization just above the unconformity grading 0.226% U3O8 in drill hole ML-525. There are several other exploration targets of note that occur on the property as well, that have yet to be fully tested. 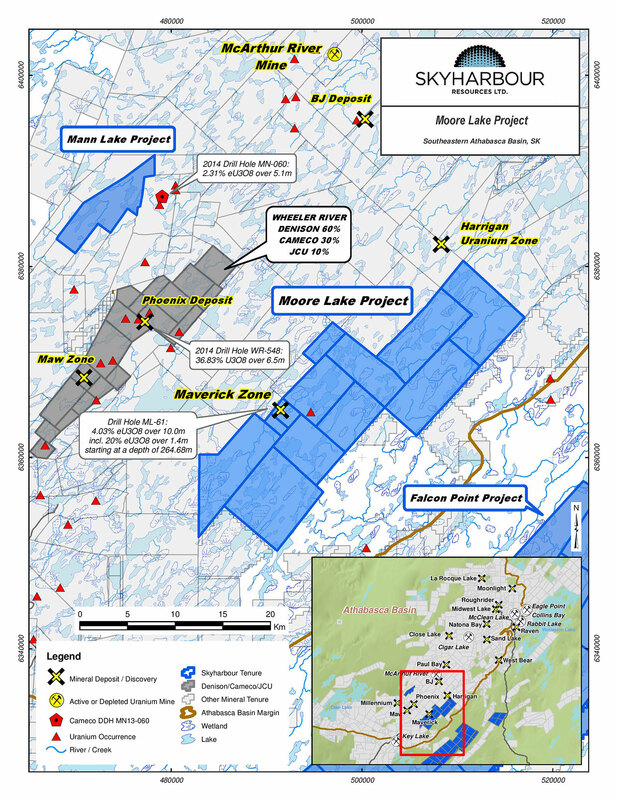 The Moore Lake Project is at an advanced stage of uranium exploration with extensive work having been carried out on numerous target areas property wide, but in particular on the Maverick Structural corridor. In the opinion of the Author of the Technical Report, there still remains a great deal of exploration potential remaining on the project lands. The independent NI 43-101 technical report dated October 3, 2016, entitled “TECHNICAL REPORT on the MOORE LAKE PROPERTY”, was issued by Cypress Geoservices Limited. Independent qualified person, Mr. Dave Billard, P.Geo., is responsible for the contents of the technical report. Skyharbour holds an extensive portfolio of uranium and thorium exploration projects in Canada's Athabasca Basin and is well positioned to benefit from improving uranium market fundamentals with five drill-ready projects. In July 2016, Skyharbour acquired an option from Denison Mines to acquire 100% of the Moore Lake Uranium Project which is located 20 kilometres east of Denison’s Wheeler River project and 39 kilometres south of Cameco’s McArthur River mine. 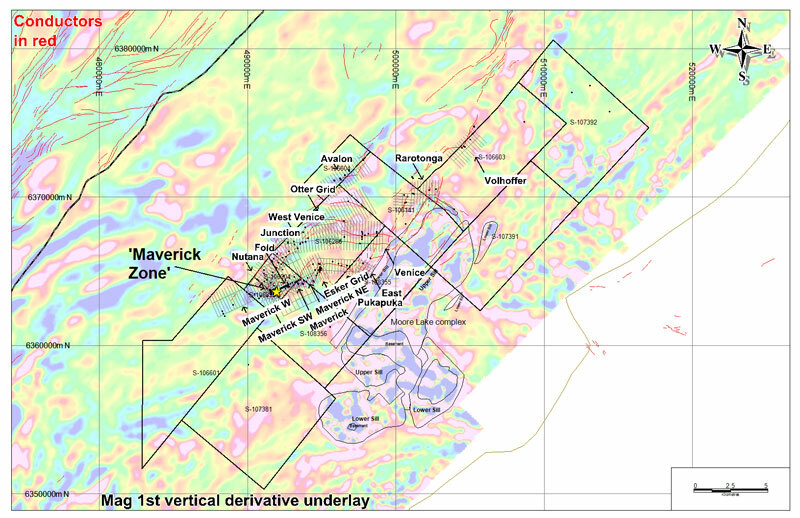 Moore Lake is an advanced stage uranium exploration property with over $30 million in historical exploration, 370 drill holes, and a high-grade zone known as the Maverick Zone with drill results including 4.03% e U3O8 over 10 metres at a depth of 265 metres. The Company owns a 100% interest in the Falcon Point (formerly Way Lake) Uranium Project on the eastern perimeter of the Basin which hosts an NI 43-101 inferred resource totaling 7.0 million pounds of U3O8 at 0.03% and 5.3 million pounds of ThO2 at 0.023%. The project also hosts a high grade surface showing with up to 68% U3O8 in grab samples from a massive pitchblende vein, the source of which has yet to be discovered. Skyharbour also has a 50% interest in the large, geologically prospective Preston Uranium Project proximal to Fission Uranium’s Triple R deposit as well as NexGen Energy’s Arrow deposit. The Company’s 100% owned Mann Lake Uranium project on the east side of the Basin is strategically located adjacent to the Mann Lake Joint Venture operated by Cameco with partners Denison Mines and AREVA, where high-grade uranium mineralization was recently discovered. Skyharbour’s goal is to maximize shareholder value through new mineral discoveries, committed long-term partnerships, and the advancement of exploration projects in geopolitically favourable jurisdictions.